It’s that time of the week again, Woo hoooo!! Guest post Friday!!! I’m sure by now everyone knows just how much I enjoy introducing one of my friends to all of you. Today I would like you all to meet Lora from Cake Duchess, Like her name implies, Lora is Baking Royalty!! Now I can’t guarantee you won’t gain a few pounds because of Lora, but I can guarantee you those pounds will be well worth it. Lora will have you drooling over her cookies, cakes and pies….oh my!! But seriously, I know your going to love her blog, her writing style and most of all, each and everyone of those wonderful treats she makes! So my friends its my great pleasure to introduce to you Lora from Cake Duchess! Hello dear readers of More Than a Mountful! My name is Lora and my blog is Cake Duchess. There are many food blogs out there, but Chef Dennis’ blog happens to be one of my all-time FAVORITES! I am very excited to be his guest poster today and I can’t wait to share with you this fabulous holiday cake. Baking has become one of my biggest passions the last few years. I spend much of my free time thinking of new creations. My little ones love to help me baking. We make a mess and we sometimes eat all the batter! I have way too many cookbooks and piles of magazines. I came across this beauty last Christmas and it was a HIT at Christmas time. The fluffiness of the angel food cake paired with the caramel drizzle, chocolate drizzle, and crunchy toasted pecans is just scrumptious! I changed the recipe a little bit and added a few tablespoons of Nutella to the chocolate drizzle. I couldn’t resist! I must confess, I could eat the topping alone. The original recipe calls for angel food cake mix. I made my own cake with my mom’s tried and true recipe. You could try my recipe. You could buy a ready-made cake. You could buy a boxed mix. Whatever your heart desires! I prefer the flavor of a homemade cake. I think your family won’t mind how you make the cake! I hope you try out this recipe this holiday season. It is wonderful. Preheat oven to 325 degrees F. Separate the egg whites in a medium sized bowl and cover with plastic wrap. Bring the egg whites to room temperature. In a food processor, spin sugar till superfine. Mix together the cake flour, salt, and the first half of the sugar. Sift and reserve. Set the rest aside. In a large metal bowl, combine egg whites, salt, and cream of tartar. Beat with hand mixer on high. Continue beating until egg whites form soft peaks. Gradually beat in the second half of the sugar (the part that was not sifted with the cake flour), the lemon zest, and the vanilla. Continue to beat until it forms medium glossy peaks. Try not to overbeat it to stiff peaks. Using a wide rubber spatula, gently fold in the cake flour and sugar into the egg whites a little at time. This should take you about four-six times. Continue folding only until the cake flour and sugar are absorbed. Take your time and do it gently to avoid deflating the egg whites. You may have a few lumpy spots and that is not a problem. Spoon the batter into an ungreased angel food cake pan (tube pan), 10×4 inches. Smooth the top with a spatula and give your pan a little shake to level it out. This will get rid of any large bubbles in the batter. Bake for about 40-45 minutes, or until cake is golden brown. Check your cake around 40 minutes. Every oven is different. 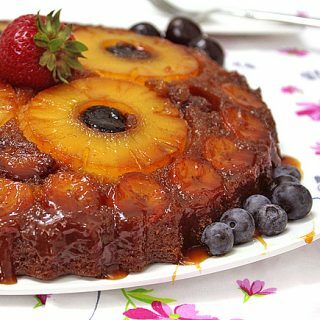 You will tell that it is ready because the cracks on top of the cake will feel dry and top springs back when touched lightly or when a toothpick inserted near center comes out clean. Immediately turn pan upside down onto heatproof funnel or bottle. Let the cake hang until it is completely cool. Now don’t worry, the cake will not fall out of the pan. Loosen side of cake with knife or long, metal spatula; remove from pan. 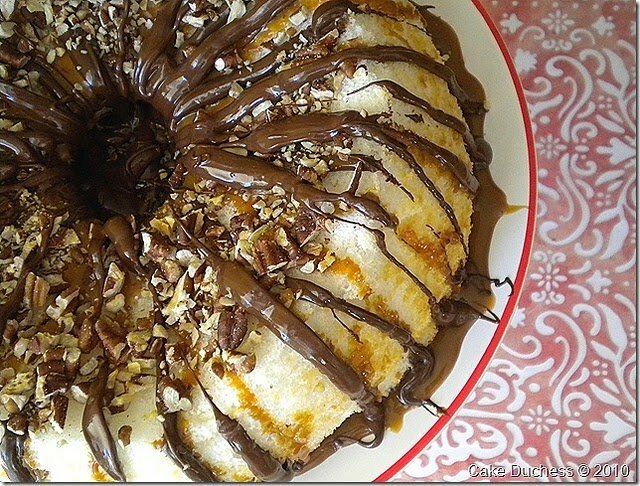 While the cake is baking in the oven, prepare the chocolate drizzle and the caramel drizzle. Place chocolate in a microwave-safe bowl. Microwave at HIGH for 30 seconds or until melted, stirring every 10 seconds. 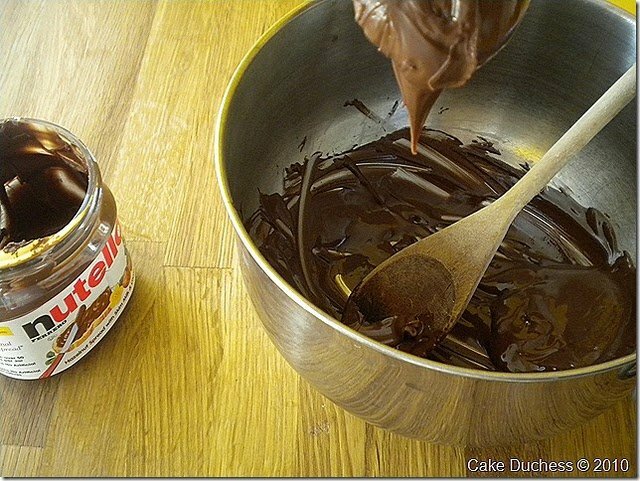 Stir in the Nutella. Drizzle chocolate over cake. I added the chocolate to a snack baggie. I cut a corner of the bottom of the baggie and I squeezed the drizzle on with the baggie. Combine brown sugar and next 3 ingredients (through salt) in a small, heavy saucepan over medium-high heat; bring to a boil, stirring just until sugar dissolves. Reduce heat, and cook 4 minutes (do not stir). Remove from heat; quickly drizzle caramel over cake. Top with toasted pecans. Adapted from Cooking Light, 2009. Recipe Notes: I found at my grocery Dulce de Leche in a squeeze bottle. That is what I used to drizzle on the cake instead of the caramel. It worked wonderfully and tasted incredible! 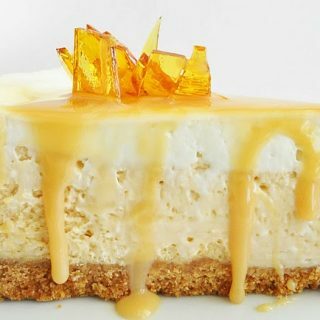 If you can’t find Dulce de Leche, this caramel recipe is delicious. Like most of my desserts, this is completely fat-free. Ok, I am fudging a wee bit! Angel food cake is the light part of this dessert. The topping is another story! It is worth every calorie! I hope you have a FABULOUS day! It has been a joy being a part of Chef Dennis’ blog. Thank you Chef Dennis for having me here today with my holiday cake! Thanks so much for stopping by today, and don’t forget to go on over to Cake Duchess and say hello to Lora, tell her Chef Dennis sent you!! Have a great weekend everyone, and stay warm! Previous Post: « Roasted Duckling or "The Demise of Daffy"
Fabulous cake for the holidays. Thanks from one sweetie to another. I love Nutella.. this cake looks amazing. I'm late to this post, but there was no way I'd pass up reading about a recipe from Cake Duchess. It's downright decadent, even if the angel cake doesn't have any fat! It looks marvelous. Thanks for highlighting this amazing baker, Chef. Oh Lora, I'm with you, I could eat the topping alone!!!! 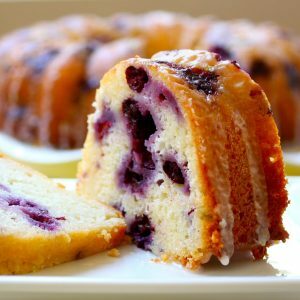 this looks so heavenly, I am so new to baking, but I must try this along with Chef D's Cannoli Cake before this year is over and I start limiting my sweet tooth!!! Another amazing guest post Chef D…. This is a beauty! Thanks for featuring Lora. Hi Lora, cool to see you here too. Dennis I love your Guest Post series and I love Lora's site. Lora this cake is definitely calling my name and I especially love that you added Nutella to the drizzle, everything tastes better with a little Nutella. Honestly I wish I could push my fork through the screen and dive in. 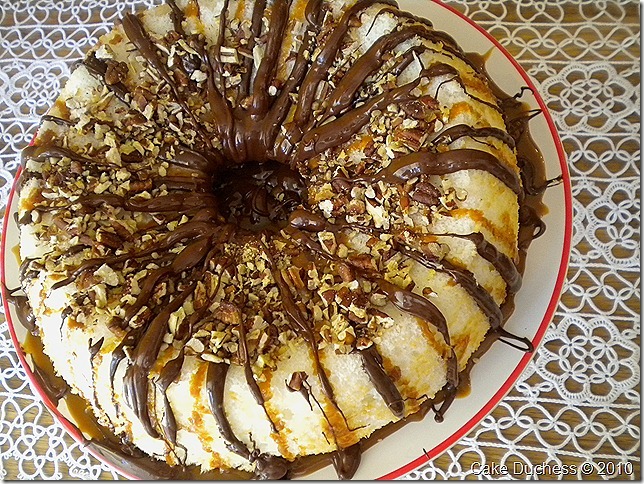 Nutella and angel food cake- heavenly! Great guest post Lora! I was so excited when I saw your guest post was from Cake Duchess! She is awesome. Lora I loveee the fact that you used Nutella in this cake…mmm and caramel. Oh Lora! What a beautiful beautiful angel food cake. Those drizzles! Those nuts! Dennis knows that I always love the people he brings on to share…but you especially are one of my very favorites. Your sweet presence is evident in each word that you write. Thank you for sharing with me. I hope that you both have a love-filled weekend. Hugs! Hi everyone! Thank you very much for these sweet comments! It was so much fun sharing this tasty cake with Chef Dennis' wonderful readers. Thank you for having me as a guest Chef Dennis! 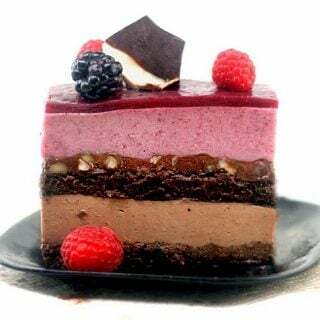 This cake looks absolutely decadent! With the week I had, I could surely go a big slice!! the fat-free part got my attention! really? haha. The angel cake looks so yummy and I like the nutella topping. Great guest post Lola! Thanks Dennis for another great guest post! I love her blog, and I AM DREAMING OF THIS CAKE! Dennis, great choice for you guest post this week! Cake duchess is quickly becoming one of my favorite blogs. What a beautiful photo of that cake! It looks amazing! 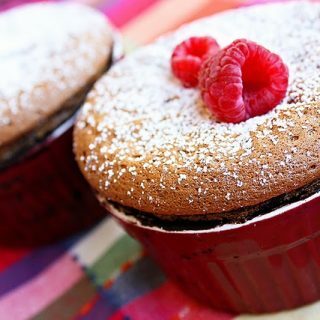 Nice post, Great recipe!! Will visit the Cake Dutchess. Ah, Lora, what a wonderful cake! I love that it can be made with easy things like store bought cakes and squeeze dulce de leche or made completely from scratch. Either way, it's a work of art! Chef, thanks for another entertaining guest post Friday. My heart belongs to Nutella! What a beautiful cake! Thanks for sharing. This cake looks sinful! Although angel food cake is so light I could probably talk myself into multiple slices 🙂 Love the Dulce de Leche idea too, thanks! Thank you for sharing this recipe with all of us. Have a wonderful weekend. Chef Dennis…thanks for introducing Lora to us…sure going to love her blog 🙂 I always look forward to Friday! It's nice to see Lora as your guest post today! I FOLLOW her blog and dream about her desserts. This cake looks like a work of art! Because it looks too good to eat maybe that will save me the 5 pounds I would pack on, haha! Oh goodness.. I haven't made angel food cake yet. How exciting to see you on Chef's page Lora!! 🙂 Your cake look absolutely gorgeous.. I would devour it. Mmmm, it's just gorgeous, Lora. Perfection, as always, no wonder Dennis wanted you to guest post! 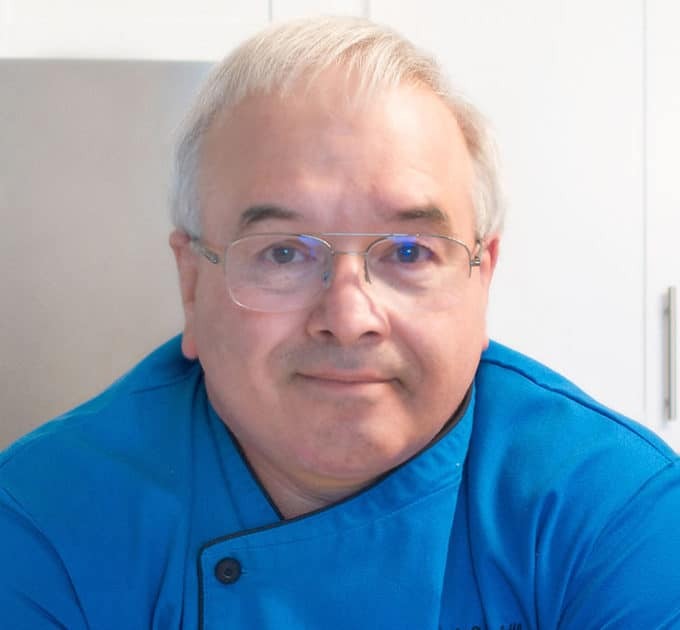 Another fantastic guest post Chef Dennis! Thanks so much to Lora for sharing such an amazing looking and sounding cake! It is absolutely beautiful! My granddaughter would be in Nutella heaven; her favourite food. Great post! The cake is beautiful. I've never made an angelfood cake from scratch but after seeing your cake I think I will! Such beautiful and special cake. Your job is really interesting. Esto es toda una tentación, que rico tiene que estar. This sounds and looks delicious! Can't wait to try to make it at home. I also love your Guest Posts Chef 'D'. Thanks to you being such a generous ambassdor and introducing us to these wonderful bloggers! Thanks for introducing another blogger! And such a yummy guest post. Chocolate and caramel were made to be BFF's I swear. Nutella is irresistable to me. I have a chronic sweet tooth so I think you and I would get along great! Dennis is pretty awesome anyone he introduces has gotta be good. 🙂 Nice to meet you! this cake looks pretty and delicious, I can have more than a slice at one go! The timing of this recipe for me couldn't have been better!! I always make an angel food cake at Christmas time and have been looking for a new variation and this will be perfect!!! I know it will taste amazing!! What a wonderful spotlight on Lora. She's such a talented baker and blogger, and you couldn't have picked someone better to highlight, Dennis. Thank you for sharing this excellent interview and Lora, thank you for sharing this finger-lickin good recipe! Lora, sweetheart-I'm so thrilled that you chose this simple angel food cake, and "dressed it up" for the holiday. The chocolate, and the caramel drizzle, along with the chopped pecan topping really made it festive, and beautiful! 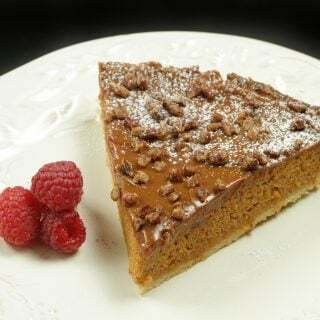 Thank you Chef Dennis, for having my Lora as your guest post, and appreciate that you have such amazing bloggers, week after week to proudly showing off their best work! Have a wonderful weekend…we are having some cool weather too, here in S. Florida. Oh yay! Lora's our guest post. Always a lovely read. That angel cake looks most divine! Love that you give all the tips and choices so we can each make it our own. Thx Chef Dennis for asking Lora to post. Wow, Lola you did a great job, as usual. Love the twist you put on the traditional angel cake and I'm drooling seeing the chocolate nutella topping. It looks so yummy. What a beautiful cake. I like that you gave several options for the angel food cake, depending on your time constraints. A wonderful Guest Post. Thank you Chef Dennis for choosing Lora as a guest Post.